Doing the happy dance in Georgia. I finished clue #5 of Celtic Solstice! I did not expect to finish yesterday, but I did. I attribute being all caught up is lots, lots of uninterrupted sewing time. Taking my Featherweight with me to Orlando and BDSI pushed me to completion. As you can see, not all have been pressed and the dog ears need to be clipped. However, I am calling it done. It's a wrap. Look down! 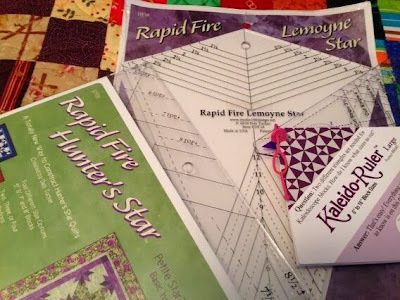 See what I started, on Christmas eve, as a leader/ender project while working on Celtic solstice. TQP #31 - I Had a Date! Oops...This episode was posted to ITunes as episode 30 instead of 31. I won't mention clues #1 and #2. Those are still in progress. But wait, hope is in the air! My plan is to finish those before the next clue comes out on Friday. If I can pull that off, that will bring me totally up to date. A first in my book! Hope to see you "Tweeting" on Boxing Day, #BDSI. 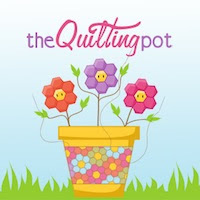 It's being host by Sandy of Quilting For the Rest of Us Podcast. In case I forget.... 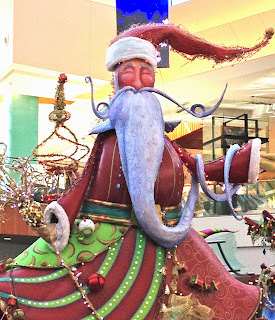 Happy Holidays!!!!!! Can You Say "Half Square Triangles"? 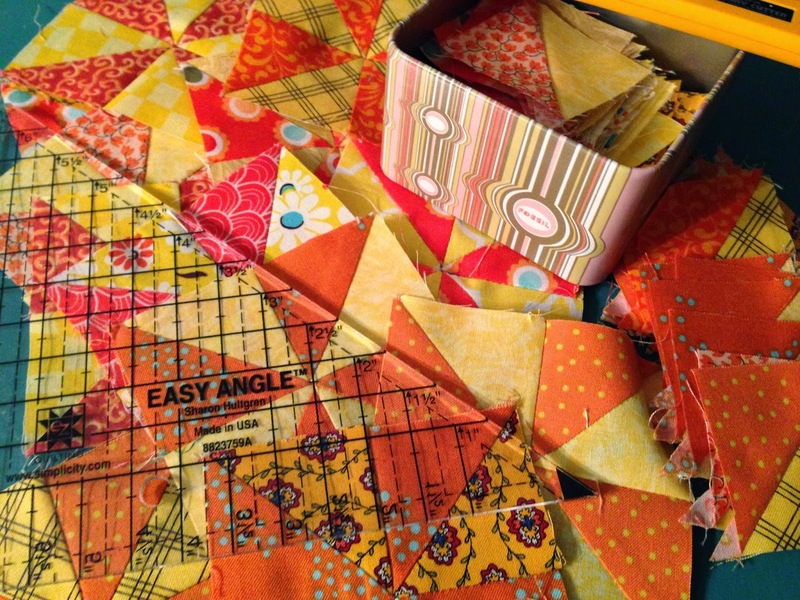 A few pinwheel blocks and lots of half square triangles. Stop the madness! I think I may finish this clue before the next clue is released. I will let you know how that turns out. My new old Raspberry 301-A is having no problem working in today's world. My mystery progress in various stages. In the beginning I purchased the fabrics. Here's a pic of my choices. And then there was the release of the first clue. After much twisting and turning of the Tri Rec ruler and cutting. This is the fruit of my labor. It may not look like much, but believe me over the Thanksgiving weekend it took all I had! I'll keep pressing on doing a few pieces each night. Ladies, please email me your mailing addys. I will get the out as soon as possible. Thanks for entering. Katie and her sewing machine drama and her crayon quilt adventures. Can't wait to go back in time and color almost inside the lines. I have always been just a tad bit of a rebel. Who would have quessed? Tanesha and her ability to pulling "Art Quilt I s" out of her @!#, I mean head. Such a wonderful ability to have. I have taken her up on her book suggestion to get started. After some restorative work. Much brighter. You can see the wood grain now. Miss Ginny replaced the original machine. She looks happy in her new home. EZ Street update: Plugging right along and continuing to take it easy traveling down easy street. 8/9 block B blocks complete. Now, to tackle 16 additional blocks. Lots and lots of little 3.5 in pieces. Will it ever get any easier? Just kidding. Piecing so many small pieces is a little out of my comfort zone. Will the quilt get done? YES; Will the piecing be perfect? NO; Will all the seams match? NO; Will is be beautiful when done? YES. Yes, the end result is all that matters. So, why not enjoy the process in a non competitive way!! Quilt Show: 01-02 February 2013, Orlando, FL; Central FL Fairgrounds. I hope some of you readers, listeners and followers can make it. I plan on being there on Friday. Let me know if you are going. Savannah Modern Quilt Guild start up. A long awaited for start up. No news yet! I hope it doesn't fade before it starts. Traveling to Jacksonville, FL once a month would not be the best for me, not to mention miles on my vehicle. 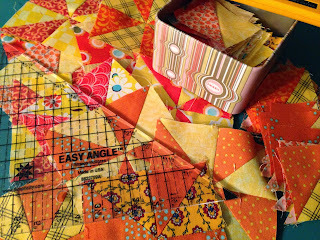 Bonnie Hunter's Quilt Cam: Easy Street, String Geese, upcoming mystery quilt in QM. 2013 Starts With A Bang!!! Easy Street finale. Remember from a previous post I eluded to "slow and steady", I'm not going to win this race! There are some who have already completed there entire top. Me, I have 2.5 of nine "B" blocks complete. Can you say lots of intersections in Easy Street? It's going to take me some time to complete the top. there is a lot of 3.5 inch blocks to put together. Please tell me that block "A" goes together must faster than "B"! I will say, it was mystery journey. Here's a link to Bonnie's Post. For those who follow on "Twitter" know that I have purchased a couple of vintage Singers. I would like to thank Bonnie Hunter for these purchases! Here is a pic of the first one. Purchased another machine, mostly for the cabinet. The machine inside is a 1910 Singer 66. Well to look at it was scary, but hopeful. I am still trying to get the crud off of it. I have pretty much taken it apart. Just so ya know, the cabinet needs a lot of help as well. Two of the drawers are missing some of its detail. But it has good bones. Here is a pic of the cabinet. The person I purchased the cabinet felt bad that the machine inside was such a mess, he threw in a machine for free!!! It is a 1956 Singer 99k, born on November 20. I was ecstatic. It needs a motor and a case. She is definitely a keeper. I named her after my Mom, Annie B. They share the same birthday. I wish she were still around to share the excitement. I think that's enough for one post. My stroll down Easy Street is still slow. Remember, baby steps. I a mom of 3 adult children and 2 "furry babies". 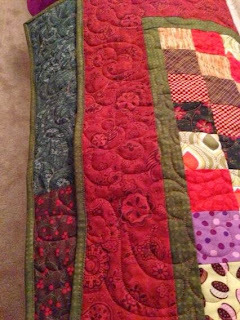 I enjoy weaving, knitting, spinning and quilting. My favorite color is "PURPLE"! 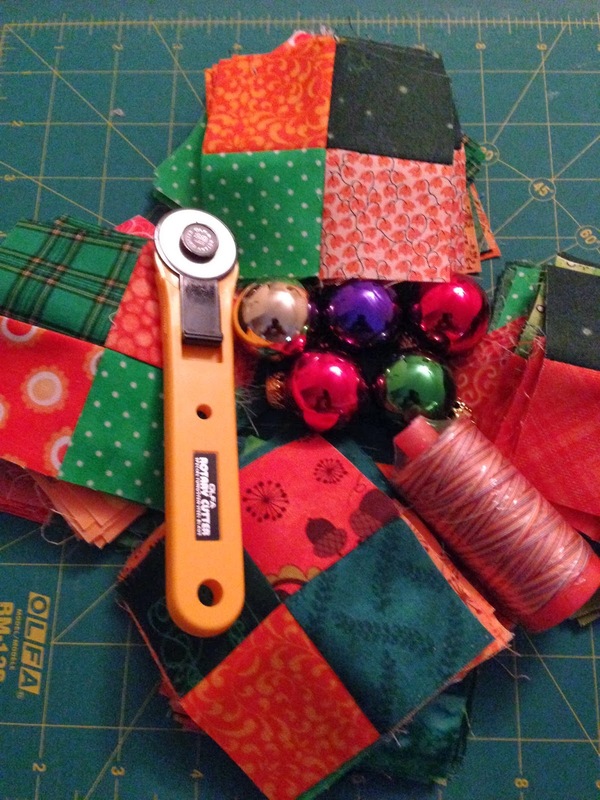 Sew ~ Stitch ~ Create!